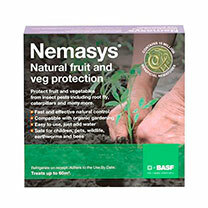 A unique mix of nematodes to target a broad range of pests including carrot root fly, cabbage root fly, leatherjackets, cut worms, onion fly, sciarid fly, caterpillars, gooseberry sawfly, thrips and codling moth. Just follow the application programmes, which targets the pests when they are active, from April to October. 60m² pack (or 16 trees). Target a broad range of pests!